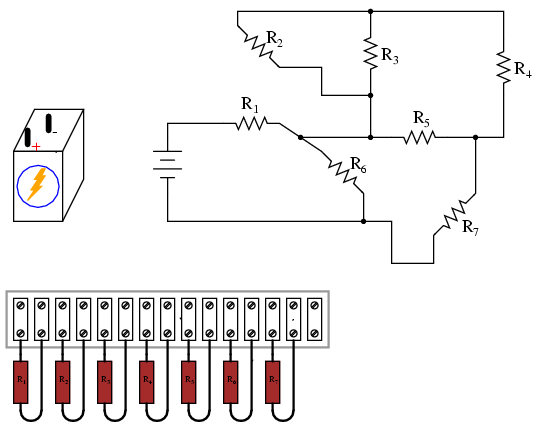 With each of these two basic circuit configurations, we have specific sets of rules describing voltage, current, and resistance relationships. 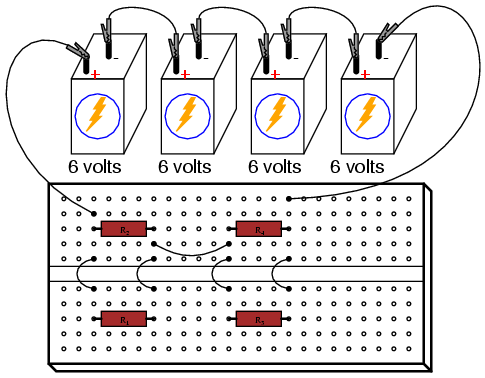 Voltage drops add to equal total voltage. 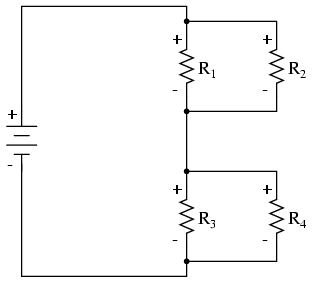 All components share the same (equal) current. Resistances add to equal total resistance. 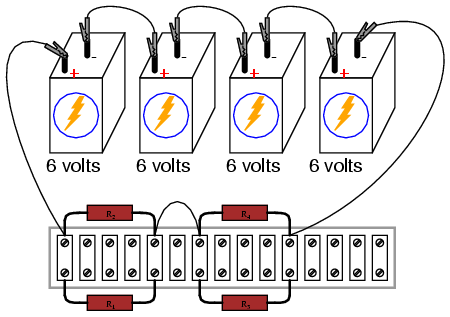 All components share the same (equal) voltage. 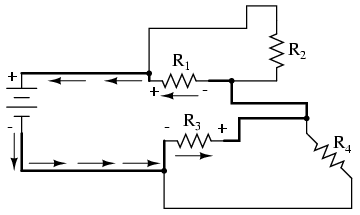 Branch currents add to equal total current. Resistances diminish to equal total resistance. 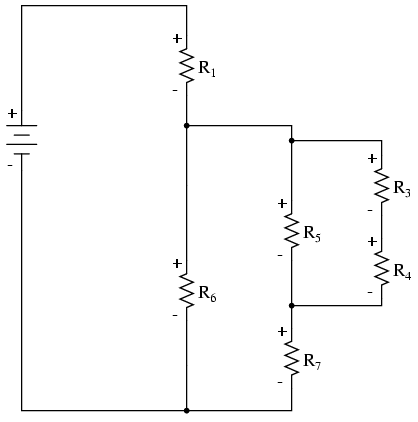 This circuit is neither simple series nor simple parallel. Rather, it contains elements of both. The current exits the bottom of the battery, splits up to travel through R3 and R4, rejoins, then splits up again to travel through R1 and R2, then rejoins again to return to the top of the battery. 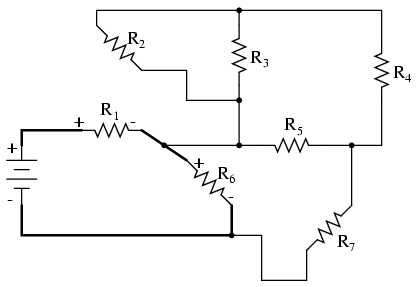 There exists more than one path for current to travel (not series), yet there are more than two sets of electrically common points in the circuit (not parallel). 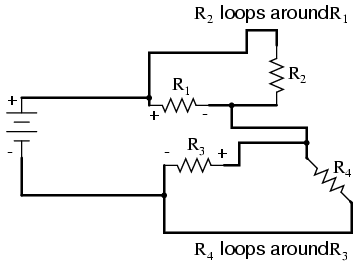 Because the circuit is a combination of both series and parallel, we cannot apply the rules for voltage, current, and resistance "across the table" to begin analysis like we could when the circuits were one way or the other. 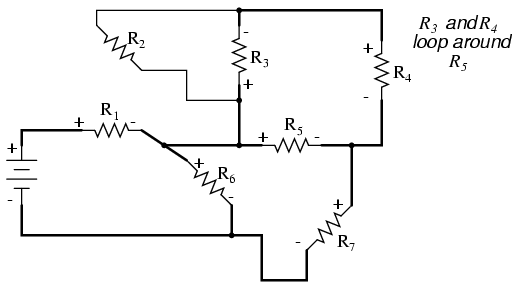 For instance, if the above circuit were simple series, we could just add up R1 through R4 to arrive at a total resistance, solve for total current, and then solve for all voltage drops. 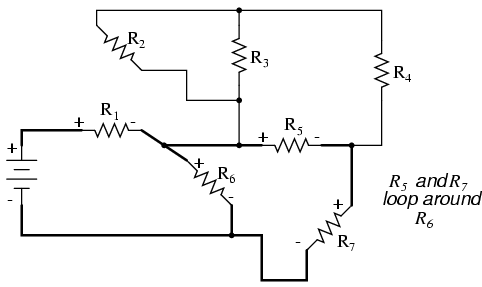 Likewise, if the above circuit were simple parallel, we could just solve for branch currents, add up branch currents to figure the total current, and then calculate total resistance from total voltage and total current. 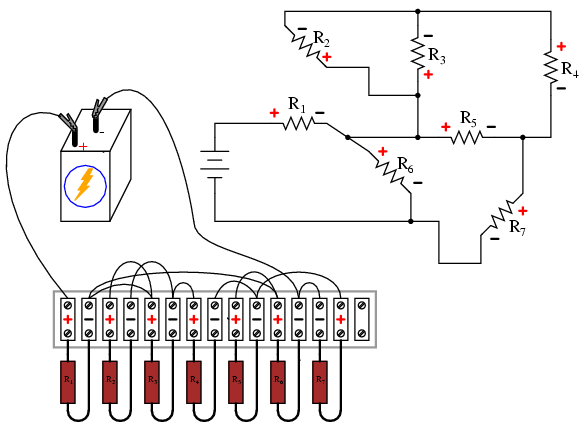 However, this circuit's solution will be more complex. 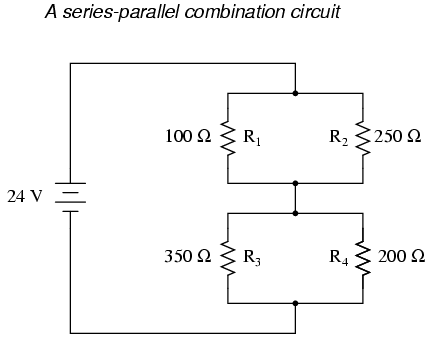 The table will still help us manage the different values for series-parallel combination circuits, but we'll have to be careful how and where we apply the different rules for series and parallel. 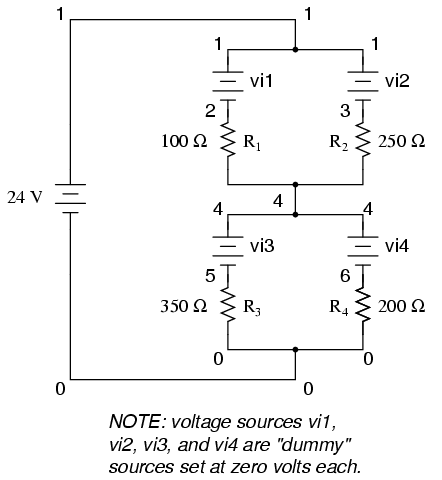 Ohm's Law, of course, still works just the same for determining values within a vertical column in the table. 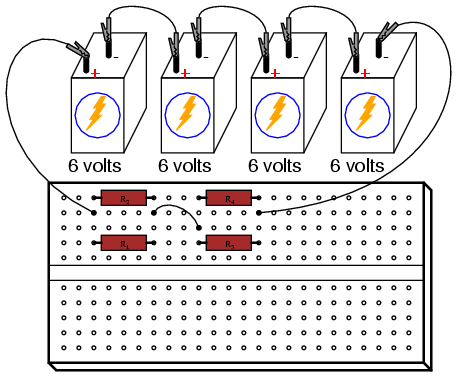 If we are able to identify which parts of the circuit are series and which parts are parallel, we can analyze it in stages, approaching each part one at a time, using the appropriate rules to determine the relationships of voltage, current, and resistance. The rest of this chapter will be devoted to showing you techniques for doing this. 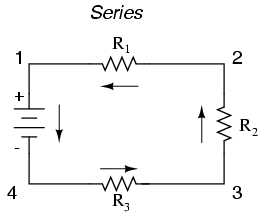 The rules of series and parallel circuits must be applied selectively to circuits containing both types of interconnections. Step 1: Assess which resistors in a circuit are connected together in simple series or simple parallel. Step 2: Re-draw the circuit, replacing each of those series or parallel resistor combinations identified in step 1 with a single, equivalent-value resistor. If using a table to manage variables, make a new table column for each resistance equivalent. Step 3: Repeat steps 1 and 2 until the entire circuit is reduced to one equivalent resistor. 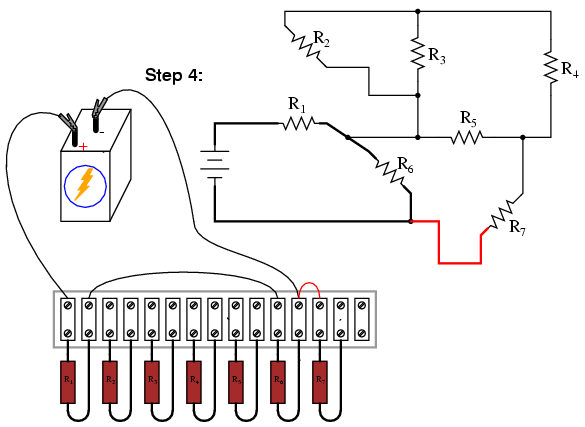 Step 4: Calculate total current from total voltage and total resistance (I=E/R). Step 5: Taking total voltage and total current values, go back to last step in the circuit reduction process and insert those values where applicable. Step 6: From known resistances and total voltage / total current values from step 5, use Ohm's Law to calculate unknown values (voltage or current) (E=IR or I=E/R). Step 7: Repeat steps 5 and 6 until all values for voltage and current are known in the original circuit configuration. Essentially, you will proceed step-by-step from the simplified version of the circuit back into its original, complex form, plugging in values of voltage and current where appropriate until all values of voltage and current are known. 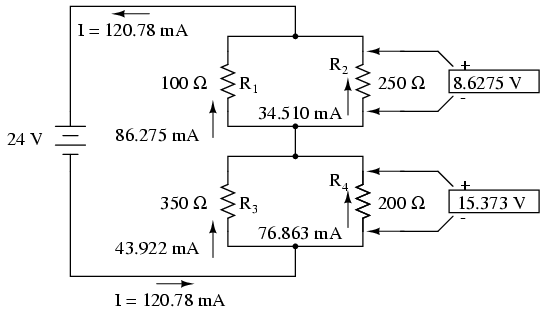 Step 8: Calculate power dissipations from known voltage, current, and/or resistance values. This may sound like an intimidating process, but it's much easier understood through example than through description. 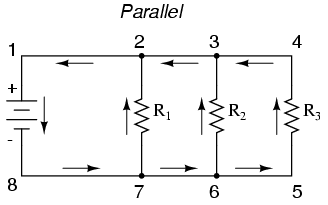 The double slash (//) symbols represent "parallel" to show that the equivalent resistor values were calculated using the 1/(1/R) formula. 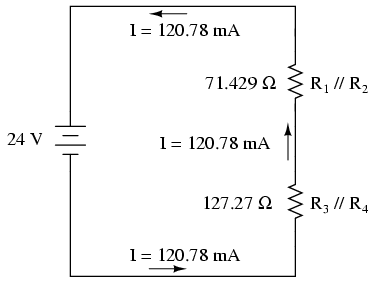 The 71.429 Ω resistor at the top of the circuit is the equivalent of R1 and R2 in parallel with each other. 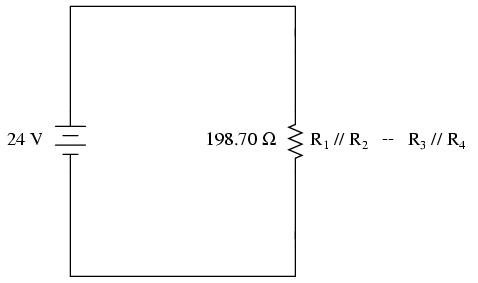 The 127.27 Ω resistor at the bottom is the equivalent of R3 and R4 in parallel with each other. 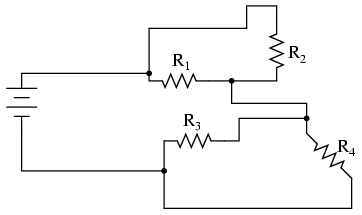 It should be apparent now that the circuit has been reduced to a simple series configuration with only two (equivalent) resistances. 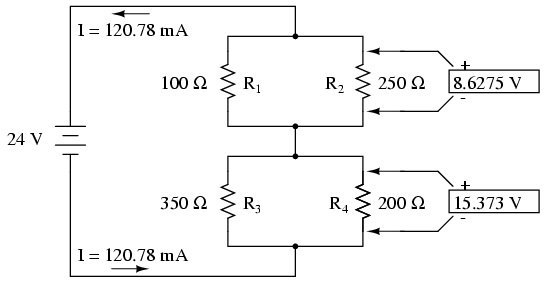 The final step in reduction is to add these two resistances to come up with a total circuit resistance. 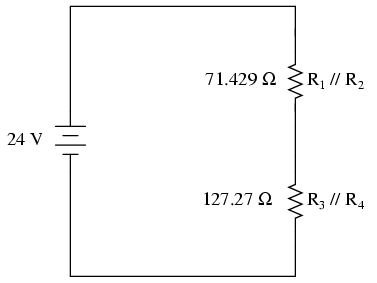 When we add those two equivalent resistances, we get a resistance of 198.70 Ω. 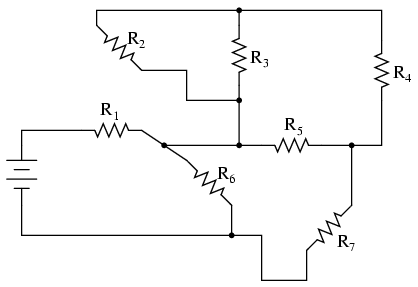 Now, we can re-draw the circuit as a single equivalent resistance and add the total resistance figure to the rightmost column of our table. Note that the "Total" column has been relabeled (R1//R2--R3//R4) to indicate how it relates electrically to the other columns of figures. 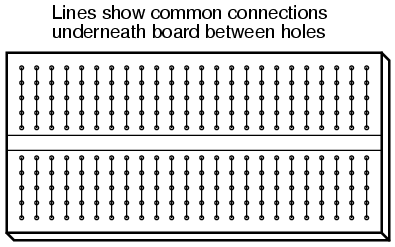 The "--" symbol is used here to represent "series," just as the "//" symbol is used to represent "parallel." As a final check of our work, we can see if the calculated current values add up as they should to the total. 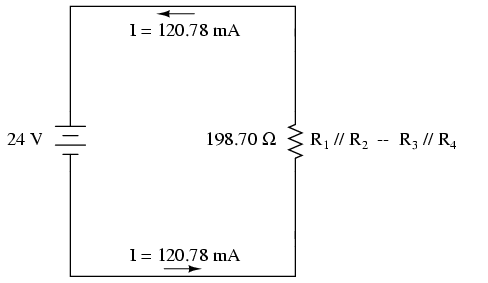 Since R1 and R2 are in parallel, their combined currents should add up to the total of 120.78 mA. 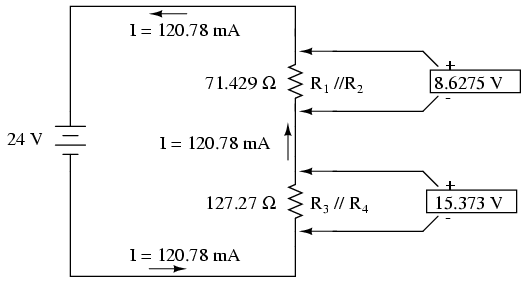 Likewise, since R3 and R4 are in parallel, their combined currents should also add up to the total of 120.78 mA. You can check for yourself to verify that these figures do add up as expected. A computer simulation can also be used to verify the accuracy of these figures. The following SPICE analysis will show all resistor voltages and currents (note the current-sensing vi1, vi2, . 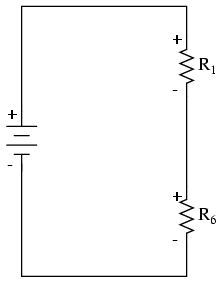 . . "dummy" voltage sources in series with each resistor in the netlist, necessary for the SPICE computer program to track current through each path). 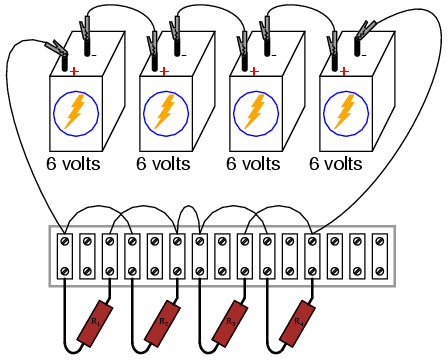 These voltage sources will be set to have values of zero volts each so they will not affect the circuit in any way. I've annotated SPICE's output figures to make them more readable, denoting which voltage and current figures belong to which resistors. As you can see, all the figures do agree with the our calculated values. 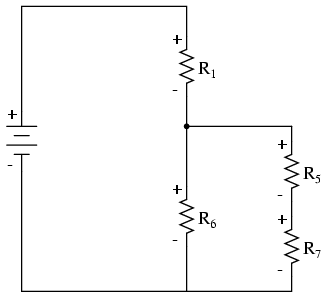 Reduce the original circuit to a single equivalent resistor, re-drawing the circuit in each step of reduction as simple series and simple parallel parts are reduced to single, equivalent resistors. 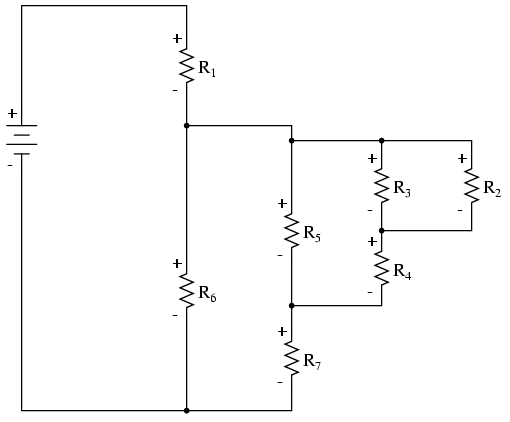 Solve for total current (I=E/R). Determine equivalent resistor voltage drops and branch currents one stage at a time, working backwards to the original circuit configuration again. 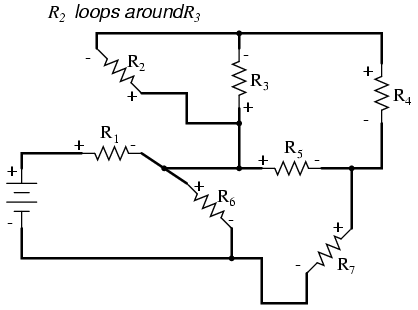 Tony Armstrong (January 23, 2003): Suggested reversing polarity on resistor R7 in last terminal strip circuit.